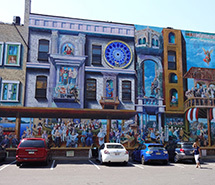 Mural artist Michael Pilato has many murals but one of his most famous is Inspiration State College, spanning over 90 feet with portraits of influential people from the State College community (Home of Penn State). 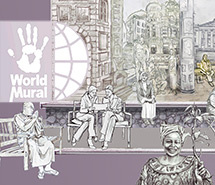 For over a decade hundreds of thousands of people have admired the massive mural and listened to the stories of these individuals aknowledged in the mural. 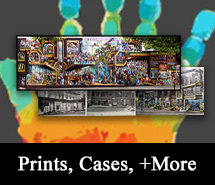 Donate Donate to help our projects and philanthropies heal the world thru art.Shop Help support Pilato Murals by purchasing prints and more! 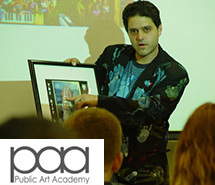 Michael Pilato is an international artist fostering community and business relationships through murals. If you area interested in creating a mural to transform a wall, building, room, or any other space, contact Michael here. 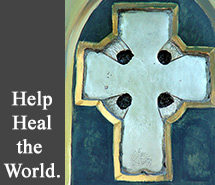 To support Pilato Murals and our public art projects, please Donate or Shop our products (right). Proceeds go towards upkeep, maintenance, new murals, and programs to support healing thru art and beautify communities with this message all over the world. Thank You for visiting, and don’t hesitate to sign our guestbook. 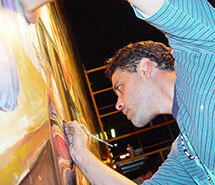 Watch the video of Michael Pilato painting the halos on the Inspiration State College mural!